People have been grafting trees for over 4000 years from ancient China and Egypt, but it remains a difficult and highly volatile process. 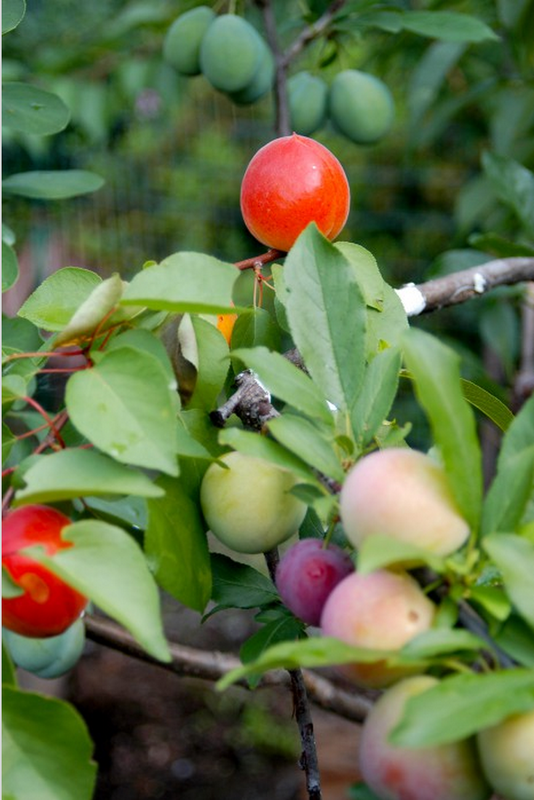 Grafting is still an extremely common practice, and most of the tree fruits we enjoy eating come from grafted trees- hardy root stocks at the base, with a sweeter, carefully selected variety on top. Over the past millennia, we've been cultivating & selecting a mystifying variety of fruits and vegetables- each with their own genetically unique taste, blossoms and growing hardiness. There are also many species of native fruits which yield incredible fruits- like the Chickasaw plum that is growing in my backyard, a hardy native Floridian fruit tree, commonly found in open grasslands like Payne's Prairie. however because of the social trend towards mono-agriculture and GMO, many of these varieties are slowly being forgotten. If you want to plant something other than a Macintosh, Fuji or Granny Smith apple, you've got to look for heirloom varieties. Sadly, the same is true for nearly every fruit, veg & plant species.. 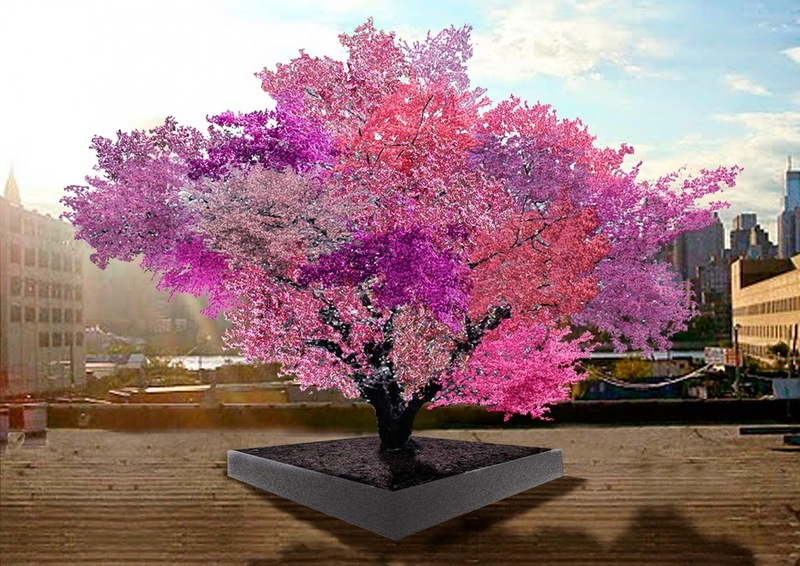 This is why it's so incredible that Sam Van Aken, a new media artist based in New York, is merging the idea of sculpture and gardening with his Tree of 40 Fruits project. He's been inspired to educate people about the loss of species diversity in the plant world, and is doing this by grafting a group of stone fruit trees (Prunus genus) with 40 different flowering & fruiting species that he wishes to plant in major cities throughout the US. While researching native & heirloom varieties, he was having a hard time finding unique varieties. Then he discovered a treasure trove of native and heirloom trees at the NY State Agricultural experimentation station. Now he has created a large greenhouse, and has already started planting several of his trees throughout the US! There is a map of the trees on his website, and more photos of his trees- which already look like they are yielding a stunning variety of colorful fruits on the same tree. TEDx Manhattan invited him to present about his work, and start this conversation about where we are headed as a society with our relationship to plants. Ethnobotanists must be intrigued at how well this highlights our cultural perspectives on fruits, vegetables and the plants that they grow on- how we value them, interact with them and whether we view them with respect or merely as simply a sweet treat from the supermarket. As a society, I think we need to get back to our roots- supermarket produce aisles make it easy to forget where lettuce or blueberries come from. I also think it's very calming and important for people to spend time getting dirt on their hands, touching plants and realizing how connected we really are with the ecosystem around us. I'm glad that people like Sam Van Aken are taking art outside the walls of a gallery, and into the living world, and I'm sure that seeing the colorful fruits of his labor are just as rewarding as the great feedback he is getting on his project.